Went soft bait fishing out near Great Barrier Island. Company Christmas trip. I will never use smelly raw bait again. UBZ wrote: Went soft bait fishing out near Great Barrier Island. Company Christmas trip. fishing softys is good fun eh!! Fun doesn't do it justice. Its like fly fishing at sea. Fully interactive, instead of just sitting and waiting for bites. I have 3kg set up at the moment but it gets an absolute hiding with big fish (havent landed any yet (could be my knots etc) but its a lot of fun) so can you recommend a cheap 6-8kg setup (oh yeah and some knots). I will use it in my kayak and off a mates boat so something cheap incase it gets damaged would be best I guess. Heath wrote: I have 3kg set up at the moment but it gets an absolute hiding with big fish (havent landed any yet (could be my knots etc) but its a lot of fun) so can you recommend a cheap 6-8kg setup (oh yeah and some knots). I will use it in my kayak and off a mates boat so something cheap incase it gets damaged would be best I guess. We were using 6-8kg rods, amazing the abuse they can handle. 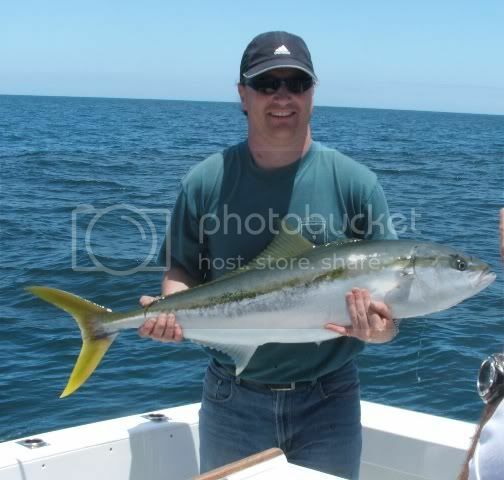 King Fish my work mate caught on the same day. 45min Fight - It took over 200m of line at one stage. 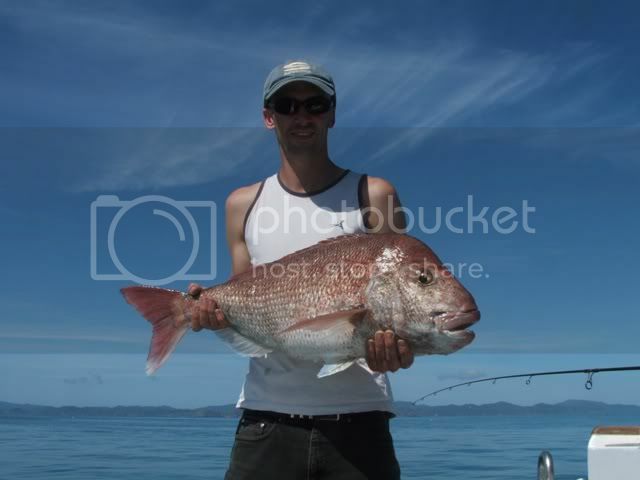 Nice fish, my brother lives on Great Barrier Island. There was a snapper comp over there a couple of weekends ago. The biggest caught was 25 pounds. Wish I was there to eat it! YUMMY!!! It's hard to be good all the time!! Goty a nice little Shimano rod and reel (6-8kg) put sdome 14lb braid on it and grabbed a tub of gulp nuck chooks. Not a bad price (wife didnt go berzerk). Tried it out at work today on our wharf (yeah thats right I was fishing while at work - Had a sport afternoon - perk of the job and there arent many of them now) but too windy and not much but little nibblers. switched to the bait rod and with a 5 oz sinker managed to get out and into the bigger nibblers. Caught 4 snapper and threw them all back. We have a rule at work anything under 35cm goes back and these were all just under (yeah if I stood on their tails and pulled maybe they would hit 20cm, with one less than 10 cm long). Came home sunburned and empty handed but had a nice afternoon at work.